This post has been updated with information on additional lawsuits that were filed in Presidio County. The company behind the Trans-Pecos Pipeline has filed eminent domain lawsuits in 394th district court against landowners in Brewster County. A suit against Roy Thomas McBride was filed Tuesday, and a similar one with nearly identical language was filed against Anchor Ranch, LLC on Friday, February 12. Anchor Ranch is operated by rancher Joel Nelson, who’s been an outspoken opponent of the pipeline. The suits, first reported by the Alpine Avalanche, are an attempt by Dallas-based Energy Transfer and its subsidiary Trans-Pecos Pipeline, LLC to condemn land for the project. As plans for the pipeline have moved along, Energy Transfer has repeatedly insisted eminent domain proceedings are a “last resort”, and that the company ideally seeks to reach voluntary agreements with the landowners whose property the pipeline is slated to run through. “While our first priority is to negotiate a voluntary easement agreement, we do have legal options available when this is not possible,” Energy Transfer Spokesperson Lisa Dillinger said in an email. Reached by phone Wednesday afternoon, Nelson said he had been working cattle all day and had not yet heard about the lawsuit. “It’s all news to me,” he said, declining to comment further until speaking with his attorney about the matter. Earlier this month, Nelson said he’d received multiple compensation offers from the company but hadn’t agreed to or responded to any of the offers yet. In both lawsuits, Trans-Pecos says it’s seeking to condemn 50-foot wide easements to build the pipeline. Texas law gives companies the right to condemn land for pipelines such as the Trans-Pecos line that are designated a “public utility.” It’s a right that’s been at times controversial and at other times challenged in court, but despite those challenges, not much has changed about Texas eminent domain law. The district clerk’s office in Presidio County said it received six new, similar land condemnation lawsuits from the pipeline company this week. Energy Transfer plans to start construction on the line in early March. Meanwhile, more pipeline shipments are expected to start arriving by rail into the Big Bend region in the coming weeks. 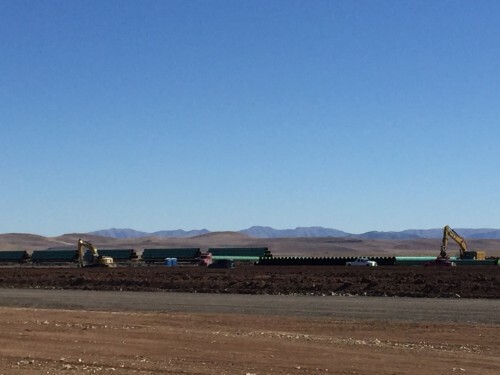 Elizabeth Grandstaff, Vice President of Sales and Marketing for Texas-Pacífico Railroad, said about six train loads will be delivered to the staging site north of Alpine this month, and then about six more trains will bring pipe to another location south of Alpine. This entry was posted in KRTS News and tagged Brewster County, eminent domain, Energy, Energy Transfer, Industry, Infrastructure, Natural Gas, Pipeline Lawsuits, Trans Pecos Pipeline. Bookmark the permalink.